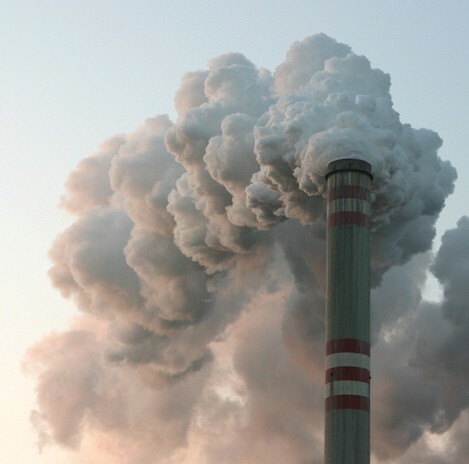 Eco-Justice Collaborative is working with a broad coalition of organizations to pass the Chicago Clean Power Ordinance, which would clean up or close down Fisk and Crawford coal plants, two of the oldest and dirtiest in the country. But the Daley administration repeatedly has stalled the ordinance, preventing it from moving forward to the appropriate City Council committees for action. 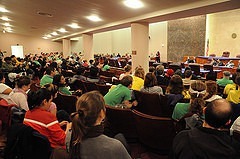 So on Monday, February 14, 2011 49th Ward Alderman Joe Moore, with the support of the Chicago Clean Power Coalition, held an ad hoc City Council hearing to solicit testimony on this ordinance from experts and the general public. And over 200 people, including Chicago public health and environmental organizations and grassroots community groups, packed City Hall to show their support. Fisk and Crawford are Chicago’s largest sources of particulate-forming air pollution. Particulate matter from these plants impairs visibility and contributes to lung cancer, heart attacks, premature deaths, acute and chronic bronchitis, emergency room visits, asthma and other respiratory illnesses. Chicago has the highest concentration of people living near coal plants in the nation, and 83% of those living within three miles of Fisk an Crawford are non-white. Those living closest to these plants are most affected, resulting in missed school days and work absenteeism. Fisk and Crawford are two of Chicago’s largest contributors to climate change. In 2007, Fisk and Crawford emitted as much CO2 as 872,00 cars. Chicago has the authority to act. The City already has regulated air pollutants and particulate matter through its Air Quality Ordinance. Testimony from doctors, environmental leaders, community activists, moms and students lasted for nearly four hours. Those speaking challenged both the Chicago City Council and Mayor Daley to stop stalling and to do the right thing: Adopt the Chicago Clean Power Ordinance and clean up or close down Fisk and Crawford. 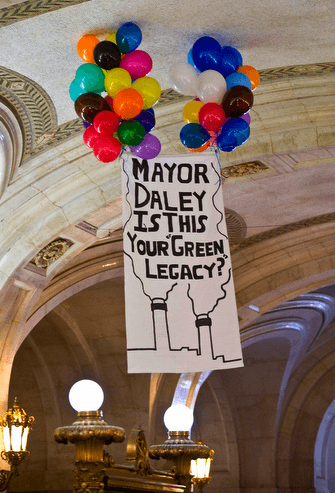 Read Jeff Biggers’ article Balloon Over Coal-Fired Chicago: Mayor Daley, is This Your Green Legacy? Visit the Chicago Clean Power Coalition’s website to learn more!